"I think what we're starting to see is more awareness around how beneficial it can be to tell a diverse range of stories and to tell them in a way that's authentic…What you're seeing is just more awareness around these conversations. And I think awareness is the first step to real change." 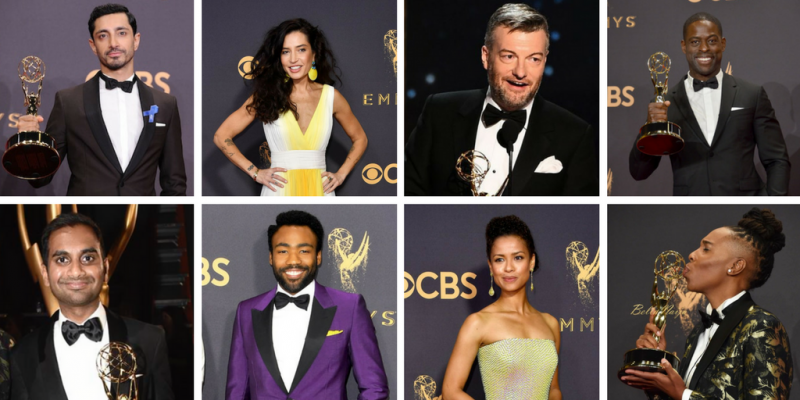 Other Brits to take home nods include Charlie Brooker and his Netflix series Black Mirror, which won Outstanding Made for Television Movie and Outstanding Writing for a Limited Series, Moviw or Dramatic Special award for San Junipero, starring Gugu Mbatha-Raw & Mackenzie Davis. The night was also historic from inclusivity point of view; history was made as Mastor of None's Lena Waithe became the first black woman to win an Emmy for Outstanding Writing for a Comedy Series alongside Aziz Ansari. Donald Glover also cleaned up for his series Atlanta, becoming the first black person to ever win the Outstanding Directing in a Comedy Series. He also won Outstanding Lead Actor in a Comedy Series. Reed Morano became the first woman to win Outstanding Directing for a Drama series for The Handmaid's Tale and Sterling K. Brown is the first black actor to win the Outstanding Lead Actor in a Drama Series since 1998.